All Terrain Chair, by MJM International, is an outdoor wheelchair that provides the perfect addition to Summer, making for a great way to get back outdoors and onto the beach. Made with MJM's sturdy healthcare-grade polymer plastics and reinforced at all stress-related areas, this chair is built like a tank. 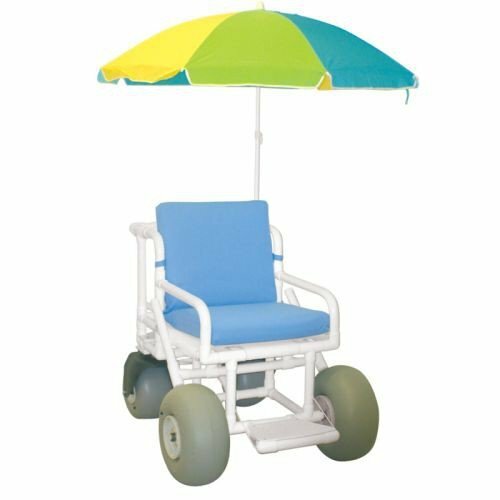 All Terrain Chair features high-flotation, heavy-duty wheels - two swivel and two rigid - with non-corrosive plastic bearings, allowing it to tackle any terrain that comes its way. The storage container offers convenience in transporting sunglasses, sunscreen, etc., and the colorful umbrella provides shade on-the-go. Vitality Medical carries other outdoor wheelchairs, such as the A4 Rigid Wheelchair and the A4 Titanium Wheelchair. Reinforced At All Stress-Related Areas. High Flotation Heavy Duty Wheels Non-Corrosive Plastic Bearing. Two Swivel and Two Rigid Wheels. It can be disassembled for storage. If you plan on travelling, it's best to contact the airline for approval before taking it with you. Does this chair come with seatbelt? Seat belts are not included with this wheelchair.